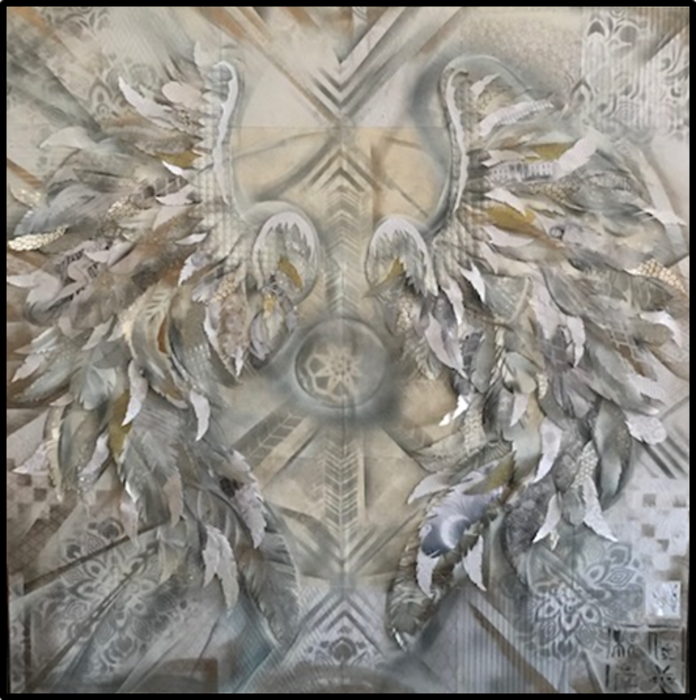 This stunning piece is created from multiple layers of collaged paper and spray paint. The work is a collaborative piece by Yuya Negishi, a Japanese mural artist and me. There will be NO paper prints made of this artwork. Numerous layers of hand cut paper pieces and spray paint from the white spectrum form this piece. In fact, there are over 300 hand-cut paper feathers in this artwork! Within the piece are 20 hidden images which all relate to the neutral WHITE. The artwork is one of 10 produced in the series Scissors Paper Spray, a manifestation of artworks each representing the seven colors of the rainbow (red, orange, yellow, green, blue, indigo and violet) as well as three additional pieces – white, black and multi‐colored.